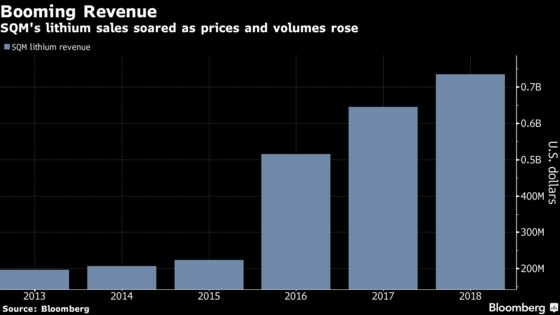 (Bloomberg) -- Two months after disappointing the market with its annual results, the world’s second-largest lithium miner said an expansion is faring better than expected and sales probably will beat its forecasts for this year. Santiago-based Soc. Quimica y Minera de Chile SA will exceed its sales target of just under 50,000 tons of lithium as output ramps up at its operations in the Atacama salt flat, according to the company’s commercial vice president of lithium and iodine Felipe Smith. SQM, whose operation sits on top of the world’s largest lithium reserve, almost doubled its production capacity in 2018 to 70,000 tons per year to respond to booming demand for the mineral essential to power the rechargeable batteries used in electric vehicles. Yet, the company’s shares posted the biggest decline in more than a year in February after reporting disappointing results and projecting lower-than-expected sales volumes. That is now changing again. Still, Morgan Stanley cut its 2019 price target on SQM to $35 per share from $44, analysts led by Javier Martinez de Olcoz wrote in a research note Friday. They became more bearish on the company after a trip to Chile in which they met with local authorities and the new Chief Executive Officer Ricardo Ramos. SQM shares on the Santiago stock exchange fell as much as 2 percent Friday to the lowest since July 2017. Ramos said two months ago that production would be just over 60,000 tons of lithium this year, but that sales would remain under 50,000 tons as the miner looked to build its inventories and gain flexibility given uncertainty in the market. Lithium producers have so far struggled to respond to a trend that’s expected to result on the market growing from about 300,000 tons to 1 million tons by 2025. Lithium carbonate produced in South America was flat at $13,000 per ton from the previous month in March, after reaching a historic high of $15,750 per ton in May last year, according to a monthly report by Benchmark Mineral Intelligence.